The bottlecap basket in the kitchen was overflowing. Cue THE LOOK from my husband. I took it as an opportunity to play with some new craft paint and stencils and made a bottle cap bracelet! I love it! I really wish I had a little one to make a kitchen out the TV stand my neighbor had on his curb. My husband gave me flower for our wedding anniversary. I put them in one of those run of the mill flowerst vases. 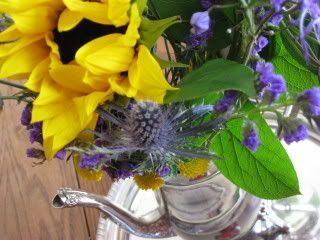 I rooted around and found our silver tea set. I rarely use it for guests. I think it makes a much prettier vase anyway. I wanted something different for my computer room. I'm not fond of painting. 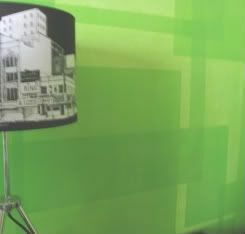 I used tissue paper as wall paper and love the results! I used Modge Podge and watered down white glue w/ water when the 'Podge ran out to put the tissue paper on the walls. I randomly placed the sheets of tissue paper on the wall. That's why it looks lighter and darker shades of green. I let it dry overnight and sealed it with clear wall glaze. I did it several years ago and it's holding up great! I do Scottish and English Country Dance. I also perform as a historical reenactor. 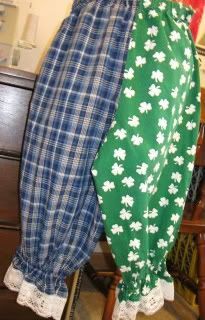 I had a dance gig on St. Patrick's Day and decided to make a new pair of bloomers to show off my Scotch Irish heritage on St. Patrick's Day. Sometimes when dancing and twirling our skirts fly up (just like when you twirled in a swingy skirt as a little girl) that's why we where bloomers when dancing. I am in love with the retro styling of your dress. LOVE! A friend gave me a stack of travel magazines that I read. 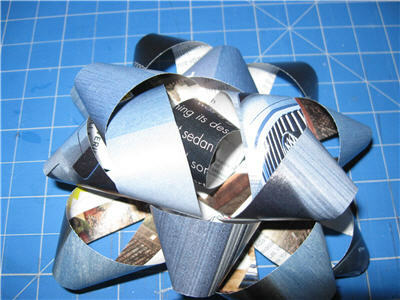 The full page photos and ads were just the thing to use to try making into How About Orange's recycled gift bows. 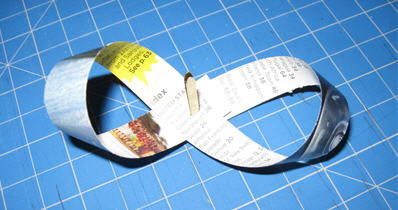 However, since my last epic craft fail involved glue, I didn't want the possible mess involved. I was almost out of staples and tape too. Instead I used 1-inch metal fasteners to make my bows. 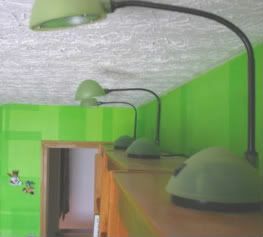 Recycling and clever reuse! Double Yay! No more running out of bows while gift wrapping! Triple yay! 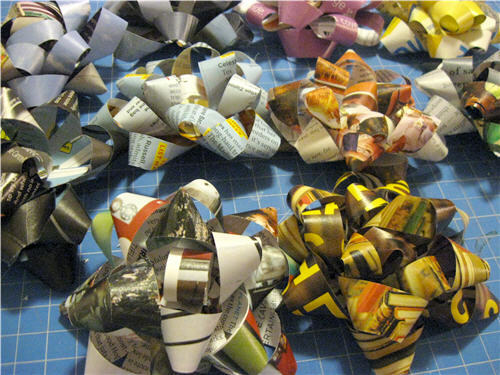 Making magazine gift bows is addictive. I want to try it using empty potato chip bags. Little Edie from Gray Gardens! I'm glad I tried the costume on before the party. It's hard to walk up stairs in an upside down pencil skirt. I'm going to open one of the side seams with a seam ripper.